NEW YORK, October 30, 2018 /3BL Media/ — In the largest, most robust, industry-leading, and internationally-recognized research of corporate social investment, CECP: The CEO Force for Good, in association with The Conference Board, found in their annual Giving in Numbers: 2018 Edition report that leading corporations are intensifying efforts to meet key societal needs around the world. Among the findings in this year’s report are that total corporate giving increased more than 15% over three years to a record $23.8 billion; top quartile companies are investing nearly 2% of pre-tax income in community programs; focus on signature/core programs is increasing with fewer, bigger community investments; measuring impact is now commonplace; employee volunteer programs and corporate giving teams continue to expand; disaster relief contributions tripled; and healthcare companies drove 62% of the increase in total aggregate giving. The top 25% of companies—or top quartile--when measuring total giving, gave at least $55.3 million in 2017, or 1.82% of pre-tax profit. Median total giving in 2017 among all 252 respondents was $19.2 million (0.87% of pre-tax profit). CECP, a coalition of more than 200 of the world’s largest companies with a combined annual revenue of more than $7 trillion, released, in association with The Conference Board, Giving in Numbers: 2018 Edition, a report on the largest social engagement survey of 252 global corporations. Now in its 13th year, Giving in Numbers is the leading research study on the funds, resources, and skills that companies invest globally to solve pressing societal challenges. 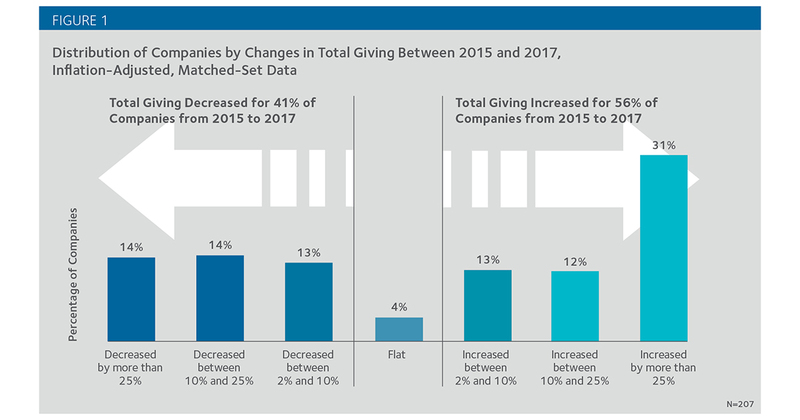 Total giving increased: Almost six out of ten companies increased giving in a three-year matched set between 2015 and 2017. Median total giving increased by 15%. Disaster Relief is on the rise: Last year’s natural disasters set the pace in terms of increasing companies’ contributions oriented towards Disaster Relief. This program area increased by more than 300% in terms of median cash giving in the last three years, as well as in aggregate: 208% in terms of total cash giving. Deeper impact of grants: Companies are seeking deeper impact of their grants through a more strategic distribution of grants. 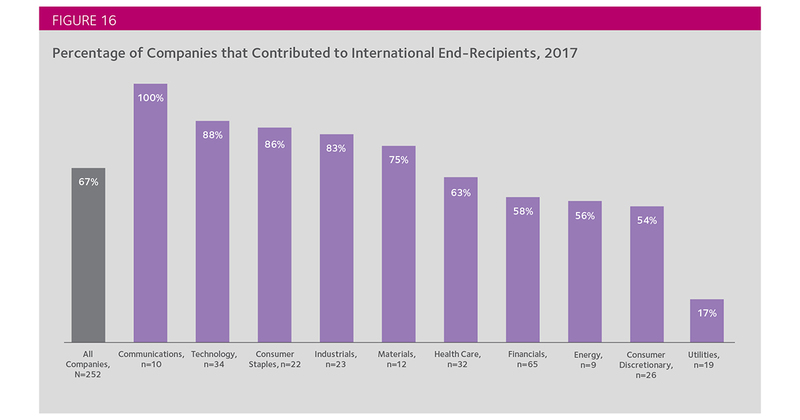 Survey data revealed more companies reducing both the number of grants and recipients but simultaneously increasing the overall size of the remaining grants to pool resources to make a greater impact. Measuring societal outcomes and/or impacts became a more widespread practice: More companies increased their measurement of societal outcomes and/or impacts of at least one grant: from 81% in 2015 to 84% in 2017 (in a three-year matched set). Most commonly, companies limited their outcome-measurement efforts to strategic programs. Companies that measured societal outcomes and/or impacts for “priority” grants were able to manage more recipients and more grants compared to those that measured all societal outcomes and/or impacts across all grants. 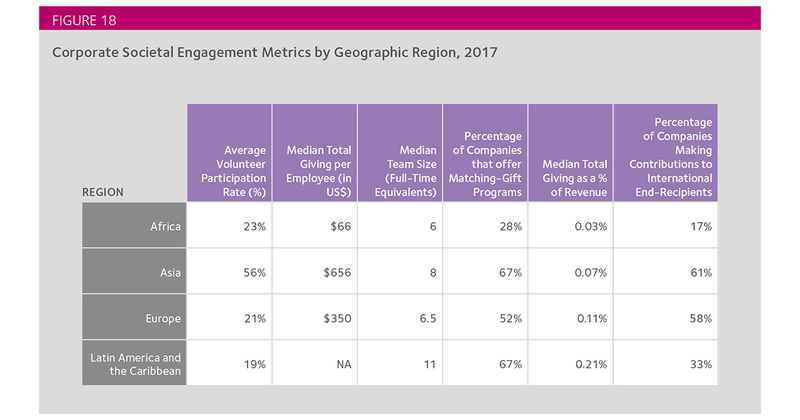 The data also show that companies that measured both societal outcomes and the business value of employee engagement also showed growth in societal investments and employee volunteer participation. 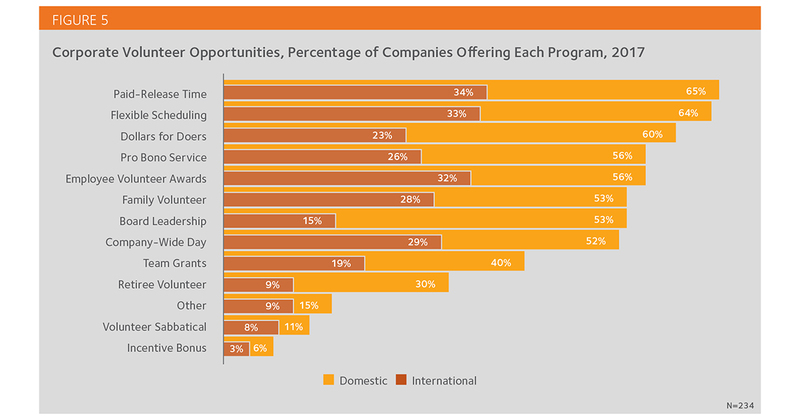 The employee factor in corporate social engagement grew in value and impact: While the offering of employee matching programs continued to grow over the last three years, companies that offered unrestricted matches – “open matching” – matched and donated a higher dollar amount in 2017. Resiliency of contributions teams: The data show that contributions staff as measured by Full-Time Equivalents (FTEs) continued to increase despite overall companies’ employee headcount cuts. This may be due in part to the exponential support that FTEs provide to their teams when it comes to managing companies’ resources, grants, and relationships with end-recipients while maximizing internal employee engagement. “The data and trends from this year’s Giving in Numbers confirm that businesses are standing strong with their social strategies while pursuing ever greater effectiveness,” said Carmen Perez, Senior Director, Data Insights. “CECP hears from corporate leaders throughout the year that Giving in Numbers is their go-to report and we're confident this year's benchmarking data, case studies, and trends will deliver actionable insights and value to our corporate partners." 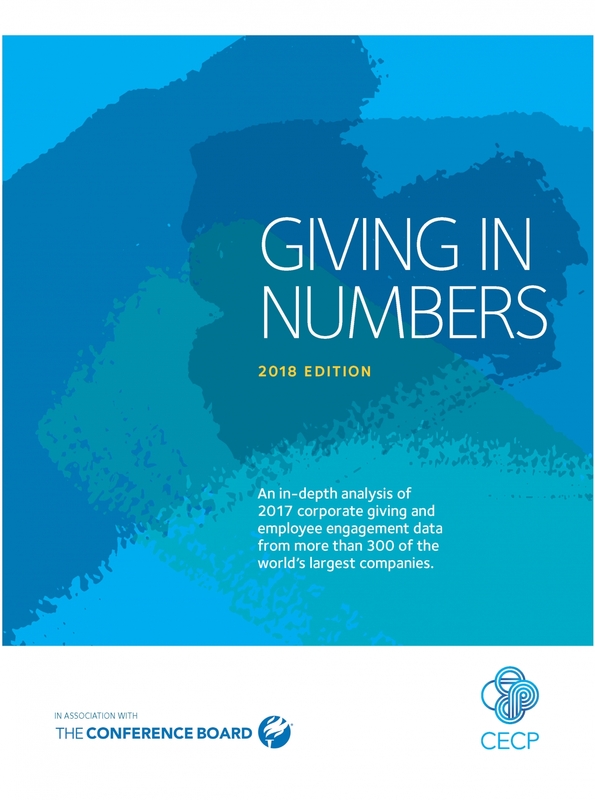 Key insights from the Giving in Numbers survey of 2017 data were released before an audience of 300 corporate societal investment professionals at the CECP Summit in May 2018. CECP also created an accompanying infographic illustrating five indicators from Giving in Numbers: 2018 Edition earlier in the summer to accompany the organization’s newest trends release, Investing in Society, the corporate sector’s annual report available here. CECP-affiliated companies access custom analysis of the data at no additional cost through CECP’s secure online portal or by contacting CECP. 2017 data is now available online. CECP is grateful to Citi, Newman's Own Foundation, PwC US, Prudential Financial, Inc., The Travelers Companies, Inc., and USAA for their support in making Giving in Numbers possible. Note to Editors: Carmen Perez is available for comment and a more in-depth look at the community investment data collected from 252 of the world’s largest companies. The Conference Board delivers trusted insights for what’s ahead. We connect senior executives across industries and geographies to share ideas, develop insights, and recommend policy to address key issues. Our mission is to help leaders anticipate what’s ahead, improve their performance and better serve society. The Conference Board is a non-partisan, not-for-profit entity holding 501 (c) (3) tax-exempt status in the United States. http://www.conference-board.org. How Do We Make STEM Education More Equitable?